The Artificial Christmas Tree Stand has a 17 Inch leg span and they will hold an artificial Christmas tree with a 1.25 Inch diameter tree pole. No assembly is required for these Black Metal Christmas Tree Stands. These heavy duty metal Christmas tree stands are ideal for trees between 3 and 4 feet tall. To protect these artificial Christmas tree stands they should be placed on a cloth (if on a hard surface), or onto a carpeted floor. Do not drag these stands, as you will chip the paint. Tree Stand Dimensions: Height = 6.5 in; Diameter = 17in; Width of Wide legs = 4.5 in - 1in; Width of Slim legs = 3in - 1in; Diameter of Pole (needed) = 1.25in; Minimum Pole Length (under tree) - 5.5 in; Above ground - 1in. 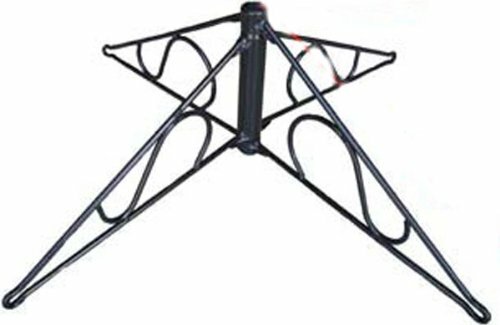 These tree stands are easy to use: Just unfold the stand, and screw the wing screw into the only hole provided for it on the stand, far enough to prevent the Christmas Tree Stands from folding again. It is not necessary to tighten the screw all the way. For the best setup possible, please read the steps below. Accurate Setup Instructions for your Metal Tree Stand: 1. Make sure that the wing screw on the tree stand is not screwed in (all the way) BEFORE you place the tree base into the stand. 2. Insert the base of the tree into the tree stand. 3. Screw the wing screw in one half turn at a time. While you are doing this be sure to keep the tree pressed up against the side opposite the wing screw, until the screw is tight. This is the most important step, as it will ensure your tree is straight up and down. Remember this saying while setting up your artificial Christmas Tree Stands , smoother is faster. Check the screw approximately 12 hours or more after you set the tree up, to see if it has loosened.